Hi, I hope you all had a wonderful Easter and Passover holiday last weekend! Also Happy Earth day this month on April 22,2018! Welcome to this month's newsletter for those of you who are new. I am changing the newsletter from weekly to monthly (the first Saturday of every month) to let you know of any news regarding our site GirlsHairTalk.com as well as new hair loss news articles written by me to you. So even though this newsletter is now monthly you will still know of all the hair loss news, I just will have more to say per newsletter. A new change to my site is a good one that I think that you will enjoy,as I am now having weekly blog posts every Friday on my site. I feel this new change will give readers a set day to count on for your convenience. If you want to buy Rogaine because of hair loss due to stress, menopause, hair loss after pregnancy, taking certain medications, or other female hair loss causes then keep reading because I share the cheapest places and ways to save on this iconic top selling hair loss product Rogaine. Here is my list of cheapest places to get rogaine online or in person, in no particular order. 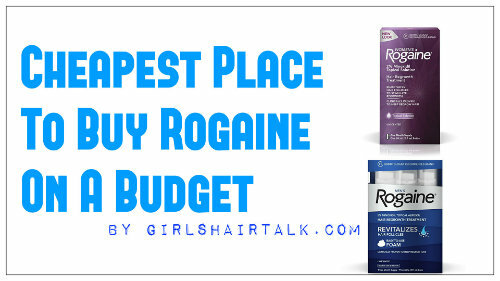 Click the link below to know where to get the best deal of authentic Rogaine Hair Loss Treatment... Read Article On Cheapest Places To Buy Rogaine On A Budget! 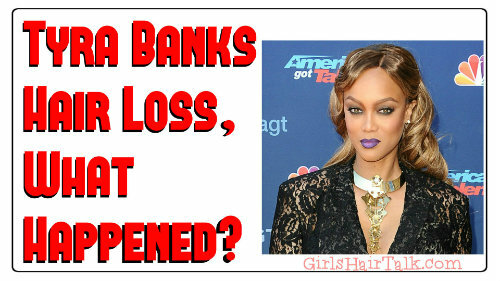 Tyra Banks Hair Loss What Happened? Click the link below to keep reading how tyra loss her hair and how to restore your hair if this is your hair loss cause too. Read Article On Tyra Banks Celebrity Hair Loss Secret , What Happened?